Amazon Pay Top up Balance let you buy anything from Amazon.in. Now you can get 10% cashback upto Rs. 100 on your 1st Amazon Pay Balance top up of Rs. 300 or more. Offer Period: from 5th April, 2017 to 14th April, 2017 . Add/load Rs. 300 or more to your Amazon Pay balance and get 10% cashback as Amazon Pay balance (“Offer”). The Offer is applicable only on the first time you add/ load Amazon Pay Balance of Rs. 300. Only the first load of Rs.300 to Amazon Pay Balance per customer in the Offer Period is eligible for the Offer. The cashback amount is limited to maximum amount of Rs.100 per customer. The customer will receive the cashback amount in the form of Amazon Pay balance, which will be credited to their account on www.amazon.in by May 5th, 2017. 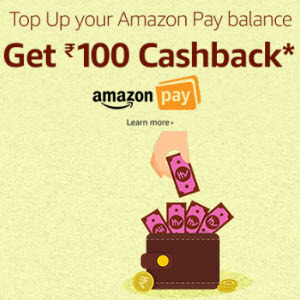 How to get Amazon Pay Balance 1st Top-up 10% Cashback on Rs.300 ? Add Rs. 300 or more (Offer valid only on 1st Top up).